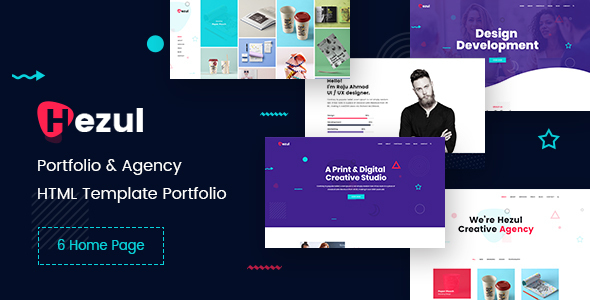 Hezul is Portfolio & Agency HTML Template, Specially Designed for Creative Agency, Corporate, Creative, Portfolio, Designer, Web developer, Photographer, Fashion Designer, Personal Portfolio, Blogger and all kinds of Personal Portfolio showcase. There are Total 6 Home Style, 18 Portfolio Page, 10 Blog Page in Different Style. We are giving an Hezul user experience focus with clean and catchy user interface looks. This Template is built with the world most Popular CSS Framework Bootstrap 3, html5, css3, jQuey, and many Modern Technology Features. This Template is created and Tasted all Cross Platform Device and Browser like FireFox, Chrome, Internet Explorer. Also, validated for W3C, and Working Dynamic contact form with Ajax. We are Always ready for answering your Query and 24 Hour Dedicated support because we try to give our client satisfaction and priority much.